We have been using Linux on board since our second season on Soledad – three years ago. There exists quite a large collection of marine/sailing software for Linux. As you might know from previous posts, we mainly use OpenCPN and zyGrib for navigation. In this post, I will explain how we got more by connecting our computer to the boat’s electronics and to an Iridium satellite phone. Note: this post just gathers information available elsewhere (forums, website, documentation, etc.). I hope you find convenient to have it in one page! A loooong time ago, boat electronic devices were incompatible between brands. Well, incompatible with everything, in fact. Then, some standards were created (NMEA0183, at first for GPS devices, then was expended to accommodate other devices) to allow communication between various pieces of equipment. With NMEA0183, one device (e.g. wind sensor) could talk to another (e.g. auto-pilot). NMEA0183 devices were quite limited (usually, they would only ‘talk’ to one other, not more) and for each device you needed a whole bunch of cable to power it up and make it communicate with the rest, often by adding ‘multiplexers’ (a device that aggregates the data from several devices and send its through a single output) in the mix. Not funny to maintain, not flexible at all. Then came NMEA2000, which is now widely adopted, most marine brands adhere to it (marine electronics, marine engines, etc.) even though they call it differently sometimes, for marketing purposes. The idea is simple and effective: a single cable (with 6 wires) runs through the boat (it is called the ‘backbone’ or ‘bus’), and by using T-shaped connectors, you can easily plug your devices (sensors, instruments, etc…) along the cable. Most devices get power and data from the bus, making the installation very easy. Power hungry devices (e.g. auto-pilot controller) usually have to be fed by specific power cables. So… now that every single piece of data regarding the boat is running through one single bus, we just need one more device that can read the NMEA2000 data and export is to some more ubiquitous media: WIFI. Those devices are called gateways ; on Soledad, we use the VesperMarine XB-8000, which is an AIS and a gateway. There are other gateways with different capabilities (just google for “NMEA2000 WIFI gateway”). I like the XB-8000 because not only I can get all the boat’s data to my computer, I can also send data from the computer to the NMEA2000 network. How does the NMEA2000 data looks like when it is exported over wifi, you ask? There are no standards for that, but most gateway makers have decided to go for NMEA0183 🙂 That’s it: my computer receives the boat’s data in NMEA0183 format, which is nice because it is mostly readable by human beeings (while NMEA2000 can only be deciphered by the devices themselves). Some organisations are trying to push for an open standard like Signal K (JSON-based), which is a nice thing. Unfortunately, most software running of the computer (or phone/tablet) expect NMEA0183 from the gateway. Display information (depth, wind, etc.) on phones/tablets/computers. When dropping the anchor, you know how far the bottom is by just looking at your handheld device. See AIS targets on your phones/tablets/computers. You can also track them to see if their course is changing. Make your computer aware of your position on earth. Your computer knows when it’s night and sets the screen darker. You don’t have to activate the GPS on your phones/tablets, which usually uses a lot of the battery: the position comes strait from of the boat’s GPS. Maintain your computer right on time with the GPS clock. Set and anchor drag alarm on your mobile. With the XB-8000, you don’t even need to have the boat’s electronics running for that since it has a GPS. Prepare a route on your favourite chart plotter and get it sent to the autopilot. an NMEA0183 software multiplexer, NMEA0183 console and filter, etc. It’s a good thing to be able to check the wind or AIS from anywhere at night when sailing. It is possible to install Linux on small disk drives. Running OpenCPN and the likes are totally possible any other OS… but you can not get MacOS on a tiny computer or get a Windows computer to work for years without becoming slow. Basically, you just give the IP address and port of your gateway’s NMEA0183 data stream. Then you’re ready to start the service (check your Linux manual for that). Then start or restart your ntpd service. Your computer’s clock will get synchronised with your GPS clock (make sure gpsd service is running! ), which is a nice way to get the right time when you are offshore. After looking for it for quite a long time, I could not find any software that would give the current timezone based on GPS coordinates AT SEA. “At sea” is important, because that is the tricky part of the problem to solve: “Nautical time zones are split into one hour intervals for every 15 degree change in a ship’s longitudinal coordinate.” (from wikipedia). Then, I discovered a software called timmeh… which seems abandoned since 2016, and that I could not make to work. Fortunately, the software being published under the MIT license, I was able to quickly build a working version. The original developer had a simple and effective idea (and I built on it): associate each place of the earth to a unique colour (see picture below – each pixel represents a 12 nm by 12 nm square). The GPS coordinates are used to pick up the right pixel in the picture. Then a small text database gives the corresponding timezone to the pixel’s colour. That is all there is to it! From GPS coordinates to pixel to colour to timezone. Here is a quick script that connects to GPSd, get the GPS coordinates, get the corresponding colour, and then gives the current timezone. You can download it from here: timezone_from_gpsd (zip file containing 3 files: the above image, the timezone database, and a bash script). Note: It requires the convert command from ImageMagick package. When we went sailing offshore with the family, we felt the need to be able to call for help in case something goes wrong. I checked what other sailors were doing and most are going for the “Iridium Go!”. To be honest, I don’t like the fact that the Iridium Go! is just a useless box until you connect your smartphone to it… and then use their specific apps to call, get emails or the weather. So, we decided to buy a second-hand Iridium 9575 Extreme phone (most of the second-hand ones are almost like new – ours had been only used for less than 8 minutes). Why did we choose this phone? In the end, the set up proved to be quite simple. The most difficult was to find the right information on the internet. There are some Linux computers using sat phones to upload data from remote places (I read about some scientific workstations in Antarctica), so I knew it was possible to make it work. PPP is the ‘Point to Point Protocol’ used to connect the computer to the remote server on Iridium’s side. ‘ACM’ is the driver to use so that the kernel know how to handle the modem inside the Iridium phone. If you did a standard Linux installation, chances are that these options are already active, check your kernel configuration. If you prefer to have the driver compiled as a module, it will be called ‘cdc_acm’. Usually, it takes around 40 seconds of connection to get everything ready. Once the IP routing info is received (including DNS information), you have to use the network straight away or the modem will just disconnect after a short period of time. Usually, I prepare the zyGrib download area before making the call/connection: I select the region (as small as possible), the type of data (only wind and wind gusts), the period (next 2 or 3 days only), the resolution (0.50°), the interval (every 6 hours) – no swell/waves unless we are concerned about that. This requests really small GRIB files from zyGrib’s server and the transfer usually takes less than 4 to 8 minutes. If you go for longer transfers, it can happen that you lose the signal in the middle of the transfer… which is bad because the downloaded piece of file is then useless. We use a long USB extension cable so that the phone can be outside on deck and have a clear view of the sky/satellites. 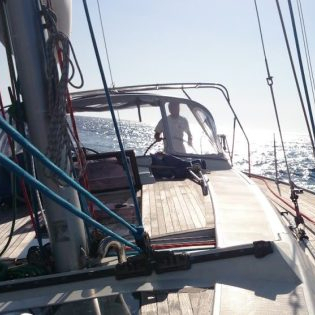 We have used this set-up between Madeira and Cadiz, and again between Cartagena and Sardinia. After a couple of days at sea, we like to update the weather file and compare it with the previous to check the current trend. Do you know about another Linux software for navigation that is pretty cool? Please let me know. Do you need help to setup your network on board? Drop us an email! I wish i were younger and could understand thia. But very interesting neverthelees. We are locked into B&G ani it ALMOST works perfectly. We have a mix of SIMRAD and B&G (which is basically the same brand) electronics and are still struggling to get the distance log (!!) working (the only thing that keep us away from perfection). BTW, we just passed in Lefkas canal a few days ago. We’re in Paxos, heading to Corfu. Are you around? Fair winds!